It is known as the hidden paradise of Mustang which provides the best trip to Nepal. Visitors will experience the forbidden kingdom of Nepal. Also called Mini Tibet of Nepal and Mountain Desert. The main attraction of this trip is Trans Himalaya landscape, centuries old monasteries, Tibetan lifestyle and people’s hospitality and ancient Tibetan Buddhist shrines like Kaanis, Stupas, Prayers wall and Chhortens. sightseeing around kathmandu valley world heritage and cultures site , Pashupatinath, Patan Durbar Square, and the Patan Museum. The Upper Mustang trek is a remote Kingdom of Nepal and northern site of the Annapurna and Dhaulagiri Mountains and is one of the last bastions of undisturbed Tibetan culture in the world. It brings you into the hidden world of the old Buddhist kingdom of Mustang, also called Lo. Lo used to be part of the Tibetan empire and is therefore closely tied to Tibet in culture, language and geography. This trek takes you to the capital Lo-Mangthang in the fascinating upper Mustang region. The regions isolation from the outside world has contributed to a highly preserved Tibetan culture and unspoiled nature. Mustang lies in the rain shadow of the Dhaulagiri massif creating a ruggedly arid land surrounded by rocks in all kind of colours and impressive formations. This barren landscape is dotted with settlements of white washed houses, barley fields and chortens festooned with prayer flags which add a splash of colour to the landscape. 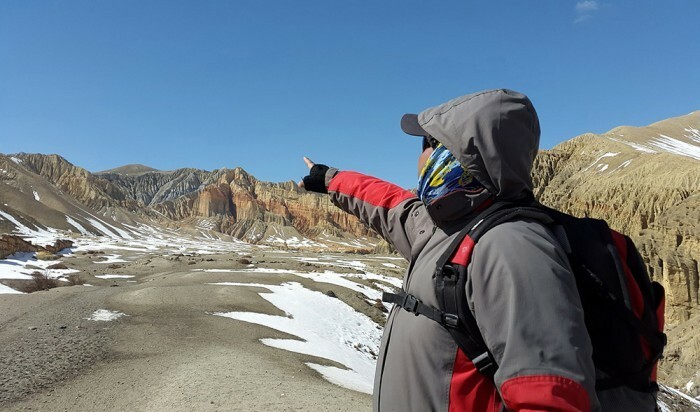 Hidden behind the majestic Himalaya ranges, Mustang is a route and best known for mountain biking too, To do trekking or mountain biking on upper mustang you need special area trekking Permits required by trekker or bikers when they visit this region. Officially, Mustang is the name of the district along the kali Gandaki river valley from the Tibetan border south to Ghasa. 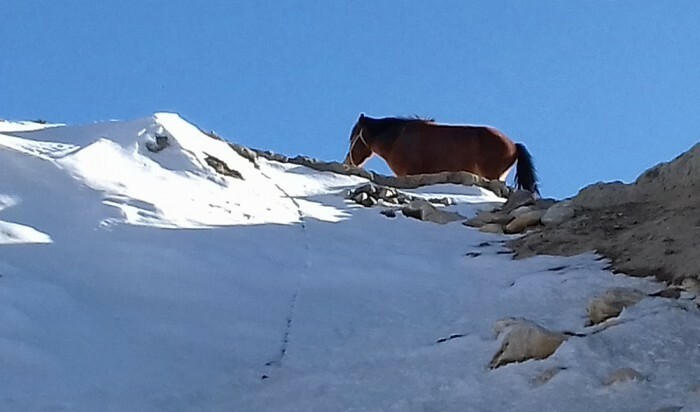 The headquarter of the Mustang district is Jomsom; which is one of the most popular trekking destination among the trekkers in Annapurna region. Upper Mustang consists of two destine regions: the south region with five villages inhabited by people related to the Managis; and the northern region (the ancient kingdom of Lo), where the language, culture and traditions are almost purely Tibetan, the capital of Lo is named manthang, which translates from the Tibetan as ‘plain of aspiration’ many texts refer to the capital as Lo Manthang, but this is not strictly correct, Other texts spell the name of the kingdom as Lho, but this is a transliteration of the Tibetan word for ‘south’ and is also incorrect. Thus the portion of the upper Mustang district north of Samar is Lo and its capital is Mustang the king of Lo is the Lo Gyelbu, though I use the Nepali term raja here. 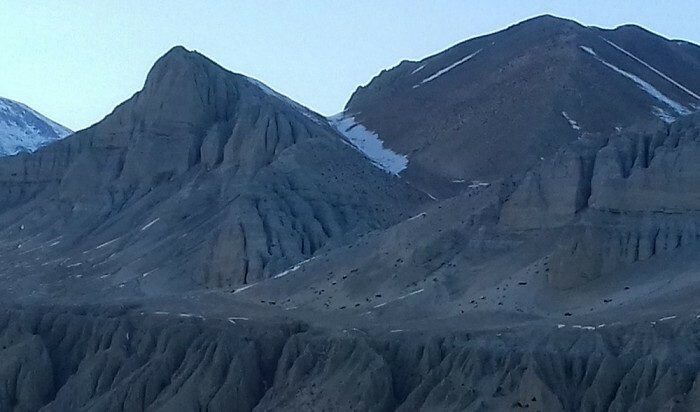 To avoid total confusion with existing Maps and texts, there are many complex issues relating to the development of upper Mustang and the procedures under which trekkers are allowed to visit the area. Arrive in Kathmandu & Transfer to your hotel. 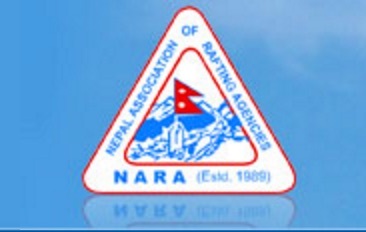 Arrive in Nepal Kathmandu international airport and be welcomed by your Adventure Hub Nepal (AHN) representative at the airport. Transfer to your hotel and relax and recover from your journey. We will then go for our welcome dinner at a restaurant nearby and have a pre-departure meeting with our group about the trip starting the next day. Sightseeing world heritage site in Kathmandu valley with professional tour guide. Today after breakfast your tour guide come and meet you in your hotel for day sightseeing Pashupatinath, Patan Durbar Square, and the Patan Museum. Between 4-6 pm pre-departure meeting for the trip at the hotel. Get any last minute personalized items or gear for the trip. Stay overnight in Kathmandu. As you are doing your sightseeing your trekking guide will do permit off your trek. Get up early have breakfast and then transfer to bus station if you are driving or if you are flying drive to airport. Driving time to pokhara is around 5-6 hours, flying time to pokhara is around 35 minutes you can choose whichever way you like travel in this case, after you arrive in pokhara you will be taken to your hotel you can get prepared for the trek next stay overnight in Pokhara. Early morning drive to pokhara domestic airport which around 15 minute drives, we will then fly to jomsom, have quick breakfast start our trek to Kagbeni, trek along the trail that follows the wide valley of the Kali Gandaki, passing through narrow alleyways and houses built around enclosed courtyards as a protection against the unpredictable wind of the Kali Gandaki gorge. The trail further meanders through stone-walled orchards. We enter Mustang and follow the east bank of the river over a series of small ridges. Across the river we can see Kang Gompa, a centre of the Nyingmapa sect. Approaching Tangbe we encounter the distinctive black, red and white chortens that typify upper Mustang. The town of white washed houses contains an intriguing pattern of alleyways and is surrounded by fields of wheat, barley and buckwheat, interspersed with small apple orchards. We cross to the east bank of the kali Gandaki river and ascend to the village of Chele. Immediately, the strong influence of Tibetan culture of Lo is evident with the decoration of the houses. Today’s trail is characterized by the crossing of a series of large spurs. Our trek wins to Taklam La Pass (3,624m) through plateaus and narrow stretches with views of Tilicho Peak, Yakawa Kang, Nilgiri and Damodar Danda. Further walk around 4 hrs will reach you at Samar or Syanbochen for the overnight. The valleys that dissect the trail have cool streams and juniper trees to enable us to relax for a while. These altitudes should not present any acclimatization issues, so we just take our time and enjoy the walk overnight stay. After breakfast we will continue trekking up the valley to Ghiling as our journey for our overnight stay, Explore the area stay overnight in lodge or tea house. We start our trek after breakfast with a pleasant walk and easily get to the Charang for the overnight. We descend to the pass a spectacular series of Mani walls (Secret stone wall of the Buddhism) to the village of Charang with its huge white dzong and red Gompa, make sure you have your camera handy to take pictures. After breakfast, we leave the Charang Khola and climb the ridge to 3,810m) windy pass of Lo, for our first view of the walled city of Lo Manthang. The trail drops to a stream and then climbs onto the plateau where the city is situated. The only gate is in the north-east corner and we make our way to the entrance. The white washed walls enclose around 150 homes, Gompas and a palace. We stay at teahouse and rest of the time explores the surrounding area. 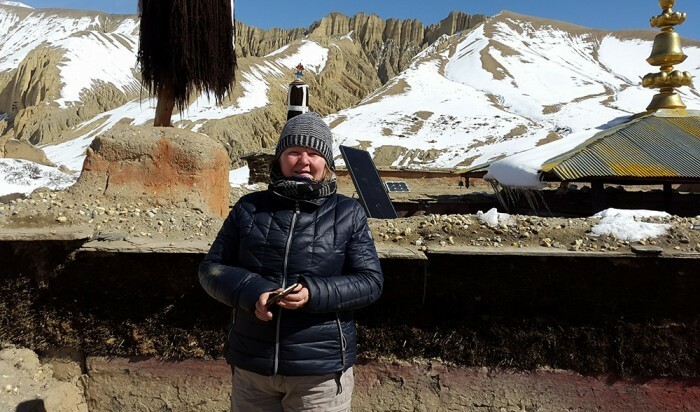 Yes you have been walking for long hours and quite few days for this so its time enjoy and explore upper mustang we have allowed full day to explore this outstanding historical and cultural centre. There are 4 major Gompas to visit during our stay. The palace is the home of the raja (King) and his rani (queen) is the attraction as well as the surrounding panoramic views of the Himalaya. Although the raja's function is now primarily ceremonial he is seen as a person who can help people resolve local issues. The town itself is fascinating, and offers countless opportunities to observe a vibrant Tibetan culture. There are many places to explore and manage your time to explore the places. Every monastery around here. After a wonderful time at Lo-Mangthang reluctantly we will depart to Dhakmar which is also interesting place to explore the local area. Climbing the ridge, we get our last view of the walled city and descend the valley towards Dhakmar. During the walk, you'll suffer the bit dust from wind and as suggested to walk in the morning. Trek from dhakmar to Ghami we will start our trek after breakfast with a pleasant walk and easily get to the Ghami for the overnight stay. We descend to the Ghaymi Khola and pass a spectacular series of Mani walls (Secret stone wall of the Buddhism) to the village of Charang with its huge white dzong and red Gompa. This wonderful morning and journey you had end at jomsom, after breakfast we check in for our flight to Pokhara. 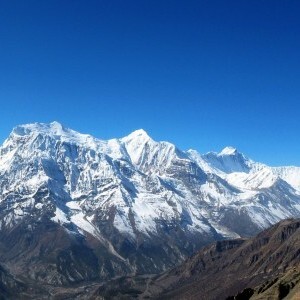 This is a dramatic flight between gorge of the two huge mountains Annapurna and Dhaulagiri. On arrival at Pokhara airport guide will transfer to the lakeside hotel rest of the day is your to explores the second tourist hub of Nepal lakeside centre and stay overnight at hotel. After breakfast, we will drive back to Kathmandu, you will still see early morning view of amazing Annapurna range mountain, Fish tail mountain and many mores as we drive back to Kathmandu and do your last-minute shopping and get ready for next day flight back home stay overnight in hotel. Fly home day and it’s your last day in Nepal! Grab some breakfast, and then adventure Hub Nepal representative will come to your and depart to airport, if you have time you can always do your last last-minute shopping in Kathmandu. We’ll make sure you will arrive at Kathmandu International Airport with plenty time before your flight back home. Now, we’ll say our goodbyes and bid you farewell, armed with warm memories and gorgeous photos to show your loved ones. Note: with weather conditions at Jomsom can affect flight times and departures so we therefore advise you to have at least 2 extra days in your itinerary between your trek completion date and your departure flight from Nepal. In the case of emergencies you can take a shared Helicopter, which can fly in conditions not suitable for planes, from Jomsom to Pokhara at an extra cost.